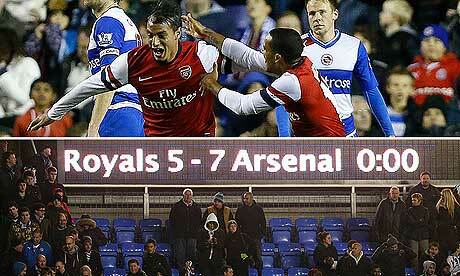 So, how about that Reading match, eh? The results in the League Cup normally don't matter that much, because the usual starting XI don't feature, and even if you're knocked out, at least it was a good chance to let the youngsters get a run out for the first team. But, Tuesday's match was like nothing I've ever seen before. You have to think, from an Arsenal perspective, that the resilience the boys in red and white showed to come back from 4-0 down to force extra time, pick themselves up after conceding an equalizer just five minutes from penalties, and still win by two clear goals will carry through to other matches. After the doldrums that were last week's losses to Norwich and Schalke plus the fiery AGM, this type of result was the perfect tonic. Which brings us, of course, to the toughest test of the season to date. United away is like nothing Arsenal has faced yet this year, in terms of competition, and in terms of drama. It was the stage of Arsenal's lowest point last year. It is the current home of Arsenal's captain from last year. There is a lot of pride riding on this in addition to three valuable points. Given the state of both teams' defenses, I am expecting a gut-wrenching shootout. You get the sense that this could end 3-2 or 4-3.
your name, it's been so long! Photo: Daily Mail. The early team news for Arsenal, as of Thursday, is not really as optimistic as I was hoping for. While Wojciech Szczesny trained this week, he's short for Saturday, so it looks like Vito Mannone gets to play again. Kieran Gibbs will not be returning either. Boo-urns. I am at least certain that Andre Santos will have a better day at left back than Armand Traore did at that position in this fixture last year. The news on Gervinho is about what I expected; that is, he'll be out at least three weeks with his ankle injury. It is still two to three weeks for Abou Diaby and Tomas Rosicky, and it will probably still be two to three weeks for them in a month's time. Still no word on Alex Oxlade-Chamberlain's hip injury, though. We'll also see how Theo Walcott does in his ability to return after playing 120 minutes on Tuesday, considering he's coming back from a bruised lung. Predicted XI: Mannone, Sagna, Vermaelen, Mertesacker, Santos, Arteta, Wilshere, Cazorla, Podolski, Walcott, Giroud. Shinji Kagawa is out with a knee injury. Photo: IBT. Manchester United, in need of a bit of a boost on defense, could get one in the form of a returning Chris Smalling. The 22-year-old broke a metatarsal bone in his foot during the summer and has yet to feature this season. This would be a bit of a "getting thrown in at the deep end" fixture for someone who is short of match fitness, however. Fellow defender Phil Jones will not be returning on Saturday from knee and back problems. He'll only return to training on Monday. He has also yet to feature this season. Nemanja Vidic remains out with his knee injury following surgery and won't be back until, at best, later in the month. Shinji Kagawa picked up a knee injury in the Champions League against Braga last week and still faces another three weeks on the sideline. With regards to the midweek matches, on the one side you have Arsenal, who reversed a 4-0 deficit after 37 minutes to win 7-5 in extra time. On the other side you have United, who blew 1-0, 2-1, and 3-2 leads to fall to Chelsea 5-4 in extra time. Then again, with regards to the midweek matches, I said in Tuesday's preview that "it's hard to talk about form when it comes to the League Cup, though, because there's so much rotation in the squad. These matches sort of take on an existence on their own, displaced from the rest of the fixture list." So, maybe you have to throw all of that out the window? It's hard to ignore the League Cup in terms of form when the match plays out like Tuesday's, though. As for form on the whole, you know Arsenal was a bit down last week. This was followed by a nervy 1-0 win over QPR on Saturday, then the madness of Tuesday against Reading. But, neither QPR nor Reading are even close to the quality of Manchester United. As for the Red Devils' form, the League Cup loss to Chelsea was their third loss of the year across all competitions. Since losing to Tottenham at Old Trafford, they have rattled off league wins over Newcastle, Stoke, and Chelsea. They have scored 24 goals in the league this year, more than any other side. Their defense is a bit leaky, though; they have conceded 13, joint most with Spurs among clubs in the top six of the table. Remember, Arsenal have the fewest goals conceded in the league so far this year, with six. That's two fewer than the next closest, Sunderland, who have played one fewer match. United have scored at least twice in all of their league matches since the opening round 1-0 loss at Everton. Six years ago, in 2006/07, Arsenal did the league double over Manchester United, winning 1-0 at Old Trafford and 2-1 at the Emirates. Since that season, Arsenal and Manchester United have faced off 14 times (10 in the league, two FA Cup ties, and a semi-final tie in the Champions League.) In those 14 matches, Arsenal has two wins, two draws, and 10 losses. The most recent win came in May of 2011, when Aaron Ramsey had the winner, 1-0, at the Emirates. The prior win came in November of 2008, also at the Emirates, via a Samir Nasri brace. The first draw came in 2007, by a 2-2 scoreline. The latter was 0-0, in May of 2009, on a day United needed only that point to win the league title. There is no use hiding from history; we all know this match last year was a rock bottom moment for Arsenal. United got a hat trick from Wayne Rooney, a brace from Ashley Young, and other goals from Danny Welbeck, Nani, and Ji-Sung Park. Carl Jenkinson was sent off. A former Arsenal player who now plays for the other team had a goal, but missed a penalty earlier. Arsenal ended up on the wrong side of a stunning 8-2 scoreline. In the reverse fixture, Arsenal conceded from a set piece just before halftime, leveled the score in 71st minute, before conceding a winner for United just ten minutes later. United are unbeaten in their last eight home matches against Arsenal, winning seven of them (and clinching the league title with the one draw). September 17, 2006 marks Arsenal's last win at Old Trafford, during that aforementioned season when Arsenal took six points from United. That match ended 1-0; Emmanuel Adebayor had the 86th minute winner. Since then, in eight matches at Old Trafford, United has outscored Arsenal 20-4. Oh dear Lord, make him stop! The referee for this match is Wirral-based Mike Dean, which, as far as I'm concerned, is worse than Howard Webb; however, Arsenal's record with Dean over the past handful of months, while not exactly peppered with wins, is not as bad as it used to be. Since 2009, Arsenal's form with Dean is now D-D-L-D-L-D-L-L-W-L-L-D-L-W-L-D-D. But, look at that! A win and two draws from the last four matches! The win was the 5-2 over Tottenham last year; the most recent draw was the 1-1 at Manchester City in September (which was a pretty good feeling draw.) The prior draw was the April 0-0 with Chelsea when both sides were more terrified of conceding than they were dynamically trying to score. The loss in that mix was the 2-1 at QPR in March. So, it's still not great form, but it's better than nothing, right? Right? 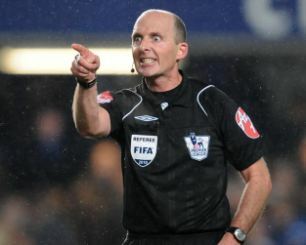 Mike Dean has worked this fixture before, twice in that above run of form, in fact. 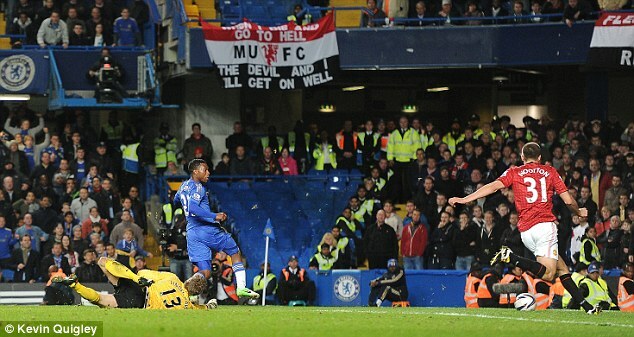 One of the early draws in that string was the 0-0 in May of 2009 that won United the league. In August of 2009, Dean was in the middle of Arsenal's controversial 2-1 loss at Old Trafford, in which he booked six Arsenal players, awarded Wayne Rooney a penalty, called Arsenal's injury time equalizer offside (it was,) then sent off Arsene Wenger for kicking a water bottle. Then again, it's not Dean's fault that Abou Diaby headed in United's winner. And sending off Wenger is now well established to have been Lee Probert's fault. All things considered, Arsenal's best form in terms of referees is with Mark Clattenburg (seven straight wins,) and there is no way he was going to get this match this weekend after what happened Sunday. Buckle up for West Brom and Southampton. It's a big one! Arsenal's match kicks off the weekend, with six other matches to follow on Saturday, two more on Sunday, and one on Monday. Five of those Saturday matches kick off at 11:00 a.m. Eastern time, the standard 3:00 p.m. time slot in England. They feature Fulham hosting Everton at Craven Cottage, Norwich hosting Stoke at Carrow Road, Sunderland hosting Aston Villa at the Stadium of Light, Swansea hosting Chelsea in Wales, and Tottenham hosting Wigan in North London. Saturday's late game features West Ham United hosting Manchester City at Upton Park. There are two matches on Sunday, one early (8:30 a.m. Eastern) and one late (11:00 a.m. Eastern.) Note that the United States changes their clocks between Saturday and Sunday, so matches will then be back to their normal times here. The early game sees QPR host Reading at Loftus Road. The late game features Liverpool hosting Newcastle at Anfield. 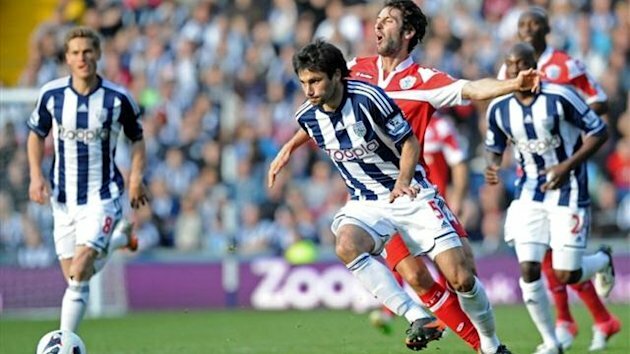 Monday night's marquee match-up is West Bromwich Albion and Southampton at the Hawthorns, for some reason. The reverse of these fixtures will be played the weekend of April 27-28.